The three things I like most about Cecconi’s are the jade green leather chairs, their rabbit ragu, and sitting at their bar drinking Proseco on tap. 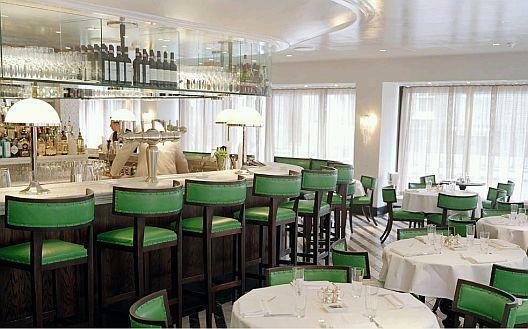 As I mostly stay in Mayfair when I’m in London, Cecconi’s is always on the list for lunch. (The Wolseley is for breakfast/brunch, Cecconi’s is for late lunch/post-shopping glass of vino), always somewhere else for dinner. I’m not sure why I don’t think of Cecconi’s as somewhere I’d eat dinner, but it’s never even occurred to me to do it. Since so many hedge funds have gone pop in London, I can only assume that it’s not quite so crowded for lunch, but I still prefer to go post-2pm so it’s a little less busy, and I know I don’t need to book ahead. Food: Italian. They serve a very wide variety of dishes, breakfast through dinner. There’s something for everyone, and the ingredients are top notch. They have a tapas bar that serves Venetian specialities all day, and the carpaccios are real good too. When it’s cold outside nothing beats a bowl of their rich, gamey rabbit ragu, and I have to admit to usually asking for it with mash rather than pasta, and was pleased to find out the first time I asked that I am not alone in this rather Irish request. Drinks: Their wine list has a strong bent towards Italy. There are near 20 wines/champagnes served by glass and 10 served by carafe which is very useful. Bottles of wine are all over £25, and as they are catering to the Hedgey crowd they do have a long and wide list. My usual lunching companion also very much enjoys their Bloody Mary’s. Ambience: Lunch is always packed, and it’s best to book ahead. There are generally two types of people who come here at this time – finance bods, and ladies who are shopping on Bond Street – so it’s a mixture of mullets, gout, pearls and Birkins. My favourite place to perch is at the bar. A wonderful solid marble affair where you can chat to the staff, see them preparing the tapas and I just like the general sociability of it all. Service: Waiters are very friendly and accommodating in my experience – not even a sniff when I ask for mash in an Italian restaurant. Cost: It’s Mayfair, and it’s part of the Soho House group, so it’s not cheap. We don’t usually get out with paying less than £50 for lunch for two, and that’s keeping it to a drink and a pasta. Easy to rack up the bill if you are there drinking and snacking for a couple of hours, as it just puts you in the mood to kick back and enjoy yourself. Working out which shops I need to visit when next in London. I love wandering around St James and Mayfair poking around the likes of Berreta, Swaine Adeney Brigg, Trevor Philip, and Turnbull & Asser etc but I haven’t been to the hatter’s Lock & Co – which I consider a massive oversight now I’ve been introduced. It wasn’t until the England cricketer Matthew Hoggard commandeered the hat of my dear friend during a rather raucous night in Lan Kwai Fong, that I had even heard of these historic and august milliners. They’ve been in the same location since 1676 so not sure how I’ve managed to miss them at 6 St James’ Street all these years. Rather disappointingly they have far more hats for boys than girls, but I’m currently deciding between the three below. You can order online, but I’m not sure I’d risk buying before I know which style suits best. Frankly, I think it would be sensible to get the robust and versatile folding Panama (centre) considering how clumsy I am, but I think for HK cruising and clubbing (daytime you understand, not going to be wearing it to M1NT of an evening, I’m not Mary J Blige…) it really ought to be the St Lucia with the narrower brim (far right).